Are you perplexed by the complex instructions on the Krusteaz box? Do you fear mixing water and powder because of your time in the Senate during the anthrax scares? Are you simply lazy?! Then, your troubles are solved. Organic Batter Blaster is here to alleviate your pancake cooking problems. As you know, this is my birthweekend, and I'm spending it in Tahoe with Rand and six other friends (Renee, Yasu, Beth, Egan, Doug and Darren). The six are arriving today, but Rand and I came up last night. After dinner, we ran to Safeway to get some morning essentials: milk, eggs, oranges, Hot Tamales, and, wait, what is that sitting there in the refrigerated egg section? Batter Blaster! I had seen BB before and was curious, but not until this year, at this sage age, did I have the cojones to pick up a can. And, to top it off, BB was a dollar off with my Safeway card. Score! Needless to say, into my basket it went. Even the guy at the checkout remarked about BB. "Wow, this is cool," he said. "I know," I said. "And it's a dollar off!" That was the extent of our conversation. Well, that and his comment about life in the "big city" which I interpreted as code for "gay." So, I winked when he handed me the receipt. Take that, big boy. Cut to this morning. I got up at a reasonable time and decided to make some breakfast. Out came the Batter Blaster. Here's where I admit that my first pancake was more of a cousin to the pancake family. Okay, a failure. I really did not do well. I blamed the heat of the pan, my unfamiliarity with the can and its nozzle, and the altitude. Pancakes #2 and #3 were better. Pancakes #4 and #5 were nearly Platonic in their idealness. How did they taste? Pretty good, if I do say so myself. But, let's be honest. Pancakes are really just a medium for butter and syrup. So, they tasted like butter and Aunt Jamima. Mmm, mmm, good. 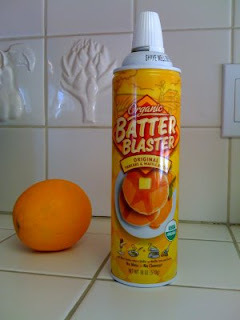 To make a long story short, I whole-heartedly recommend Organic Batter Blaster. It's easy, fun, and you can tell your friends that you made pancakes from a can!